Here’s an interesting random sample of anti-Mormon statements/actions through the ages. “…the Mormons must be treated as enemies, and must be exterminated or driven from the State if necessary…”óGovernor Lilburn Boggs of Missouri, in 1838. This “extermination order” resulted in the deaths of at least 60 Mormons as well as the rapes of dozens of Mormon women and girls. Countless others died from exposure as they were forced to evacuate the state. The extermination order was finally repealed in 1976. 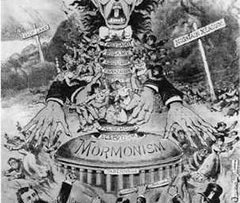 An example of early anti-Mormon propaganda.